The Legend of the Greasepole Team consists of the diverse group of Queen's students who brought this massive technical project to life. for The Legend of the Greasepole's first financial contribution. for use of their equipment and studio time. who helped us realize this was all possible. for support, guidance and being an all-around awesome person. who cared, and helped keep us on track. You were all awesome, and we used as much footage as we could. From Day 1, The Legend of the Greasepole team has been committed to a purely legal production. We have purchased every piece of software used in the development of The Pole Game and The LegendWeb and encourage others to do the same. We have received written and/or verbal permission from each of the above cast members for the use of their likenesses within the Pole Game. 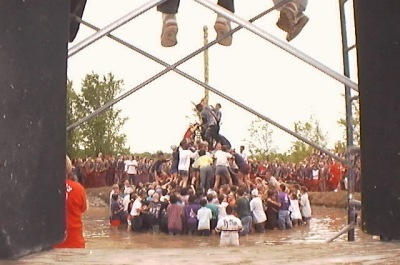 The characters being portrayed in the game are fictional, and while the Pole Climb is a real event, none of the events portrayed within The Pole Game actually occurred. The Male ArtSci, Female ArtSci, Male Commie and Female Commie characters were not filmed at the Greasepole and the effect of them falling into the pit was simulated. The Legend of the Greasepole designers are indebted to the many authors and contributors to the Queen's Engineering Society Web, found at http://engsoc.queensu.ca. The Legend of the Greasepole team made every effort to contact the current webmasters and confirm that it was acceptable to use their material on the CD. Additional legal information is found in the LegendWeb section of the Legend of the Greasepole CD. "The Legend of The Greasepole" and the "TetherFrosh" logo (the image seen in the left margin of this web page) are trademarks of WonderWare and may not be used without permission. No Frosh were harmed in the production of this game.